Do you experience difficulties with the process of window washing around your property? Your efforts are not enough to wipe stains, water streaks and dust build-ups from glass surfaces? The specialists of window cleaning in Millwall will help you out! Say goodbye to the countless hours of polishing and wiping – the skilled and experienced team will deal with this matter. You will be able to enjoy your free time – just let us do this time-consuming and tedious chore for you. Our professional approach will grant you lots of benefits. We also provide our professional services in nearby areas: Tower Hamlets, Poplar, Westferry, East India, Mudchute. You can rely on the team - they are truly the experts of window cleaning. They all have passed through diverse training, so you can get top-notch help for all glass surfaces types. What we can wash includes: single, double, garden windows, bay or sash windows, patio doors, French doors, conservatories and roof windows. Your building can freshened instantly with our assistance. Call us every time you need efficient window cleaning for your house or business. With our abilities and expertise, the great look of your property will be noticeable quickly – the adepts of commercial window cleaning will deal with this matter. 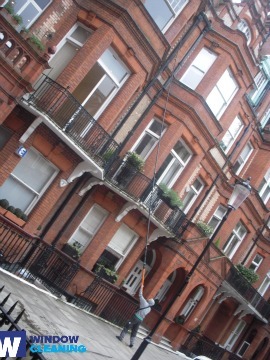 We use water-fed extension pole system for speedy and efficient window washing, up to the fourth floor. For high-rise office buildings, we use the latest rope access tools. With this equipment, we are able to reach the highest glass panes, even on the skyscraper-sized buildings London is so popular with. From small shops to towering business edifices, we guarantee top-notch services – book, now! We provide first class window cleaning by using latest methods. We ensure perfect and absolutely clean look for your glass surfaces, roof windows and greenhouses with water-fed cleaning system and jet washing. The poles we use are connected to water supply devices in our vans, thus eliminating the risk of damage to the exterior of your home or business premise. In addition, we use completely safe rope access techniques to clean glasses on tall buildings. You can take advantage of these techniques today – phone us on 020 3746 3113! Book our swift and professional domestic window cleaning in Millwall. We will clean the windows of your property both inside and outside. The solutions we use are eco-friendly - you will have the great end-results and make a green choice. In addition, we use only purified water. Don't wait, call 020 3746 3113 and order our first-rate services. Our customer care staff will take care of you – they are on-call 24/7. Another ways of booking – our request-a-service online form or just chat with our operators. The nearest tube station serving E14 Millwall is South Quay.